While James Wan has been busy blowing up cars, Leigh Whannell has been on a horror film binge. Right after his success with Insidious 3, he already has another film to pop out. Co-written with Glee Co-Creator Ian Brennan, Cooties takes a different approach to the zombie genre: adults running from zombie children. As soon as I heard that this was becoming a film, I knew that it had my name written all over it. From the look of the trailer, I see a hilarious and bloody ride with an all star cast. 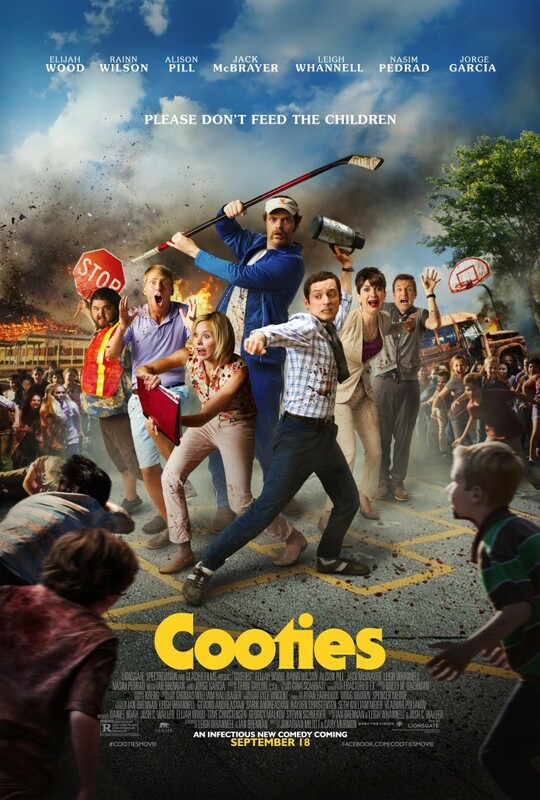 From the twisted minds of Leigh Whannell (co-creator of Saw and Insidious) and Ian Brennan (co-creator of Glee), Cooties is a horror comedy with unexpected laughs and unapologetic thrills. When a cafeteria food virus turns elementary school children into killer zombies, a group of misfit teachers must band together to escape the playground carnage. The film stars Elijah Wood (The Hobbit, Lord of the Rings), Rainn Wilson (The Office), and Alison Pill (The Newsroom) as teachers who fight to survive the mayhem while hilariously bickering in an uncomfortable love triangle on the worst Monday of their lives. Cooties will be one of the debut releases of the newly-launched Lionsgate Premiere label, which will release the film on September 18th in select theaters and on demand.